In my previous post about Zombie Aid, I promised Carl Whiteley and Zombie Aid the opportunity to respond. I wanted to give Carl time to respond both publicly (via the various Zombie Aid websites and Facebook groups), and privately (via e-mail). I would have thought that if Zombie Aid could prove my claims wrong, then the sponsor wouldn’t have pulled out. But what do I know? I’m rather bored and foolish. Carl has by now made quite a big deal out of the difference between these two words – he’s quoted dictionary definitions, he’s insisted that on certain parts of his site he said ‘proceeds’ – Carl is clearly of the opinion that saying ‘all proceeds go to charity’ means that you don’t have to give the charities anything at all. Because that’s what he did. I’m not merely suggesting he didn’t give the charities enough – I’m telling you that he didn’t give the charities anything at all. Add to this the fact that Zombie Aid did say “every penny goes to charity” a few times as well, and you could be forgiven for thinking that this man – a man who is now apparently convinced that there is a massive difference between the words ‘proceeds’ and ‘donations’ – was deliberately trying to confuse donors. This is hardly a ringing endorsement of his behaviour. It looks like someone – from one charity, who can’t speak for both of them – politely saying, “we’d like some money in the future please”. ‘Well, they didn’t insist on the money I’d promised them’ seems to be Carl’s ‘proof’ that the Charities were ‘okay’ with his behaviour. I’d also point out that Manchester Carer’s are a very small charity, and The Christie are a very large and well known charity – Manchester Carer’s may well have appreciated the publicity. I’m pretty sure The Christie (which raises £12m a year) don’t need it quite so much. Carl: I have been misquoted and made to seem dishonest. […] I have never hid the facts that no money was raised at Halloween last year. This was told to members of facebook and to the charities, both of who were aware that this may be the case. Carl didn’t tell anyone on Facebook until March, after I first started asked questions and investigating what had happened to the money. 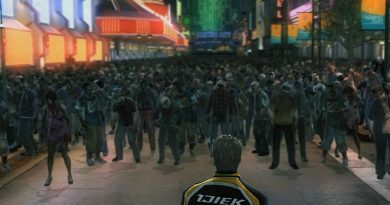 […]The Halloween Parade was to be a separate annual event. Yes it was run buy me and yes I used zombie aid to get it off the ground. It CLEARLY STATED on the flier and marketing that proceeds would go to charity. Both charities were made aware that i needed to cover some losses from summer. 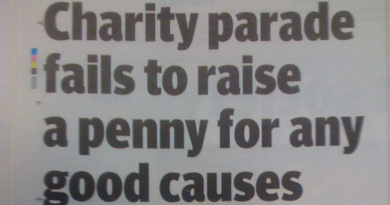 […]the added bonus was that charities got something. But I had spent a great deal on stuff and needed to recoup losses. Carl makes this point a lot – that the Halloween Parade and Zombie Aid are separate. 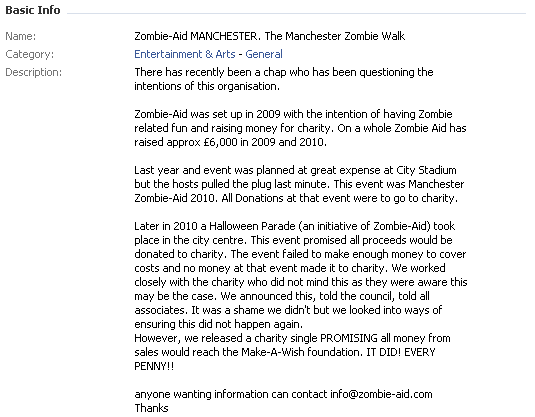 So why is money collected for the Halloween Parade being used to pay Carl’s expenses for his summer losses (which was – and I quote from above – “Manchester Zombie Aid 2010″)? Why is ALL (or ANY) of the money collected at the Halloween Parade being used to pay for the failed summer Zombie Aid event? You also state we are not a registered charity. no, never have pretended to be. Really? You might want to take another look at page two of your Halloween Parade flyer. The other Zombie-Aid events in the UK are ran independently. I allow then to use the Zombie-Aid and logo on their events on the condition that all proceeds go to charity. If the other Zombie Aid events are independent, why is Carl taking credit for the “approx £6000″ raised by them? And they are independent – Carl has stated so several times; and it’s not like Zombie Aid is anything other than a name Carl decided to use one day – it isn’t a registered company. It isn’t a registered charity. It isn’t anything but a name, a logo and a website. Zombie Aid events that aren’t organised by or connected to Carl Whiteley seem to successfully raise money for charity – the Birmingham Zombie Walk raised £835 in 2010 and £1,898 this year, for example. Other (non-Zombie Aid) Zombie Walks seem to raise money for charity, too – Zombie Pride 2010 in Manchester raised £2000 for the LGF while the Dublin Zombie Walk earlier this year raised €5,000 for their charities. But the events Carl is involved with – well the Halloween Parade in 2010 raised nothing for charity, and he now admits to taking a cut from the walks in 2009 as well. In 2009 Zombie-Aid Manchester […] personally gave to charity […] over £1600. And yes, it would have been more but there were costs to cover. As a point of interest, there were 1,110 people registered at the first walk in 2009, and more registered at the second (I’d give you Zombie Aid’s exact figures, but someone has been deleting them), all donating £2 each – so that should have been well over £3000 collected. As another point of interest there were no policing costs in 2009, according to Greater Manchester Police. And Carl. Your issue is that Halloween 2010 made no money for charity. […] I can see that I hadnt been clear to you in relations to one thing saying 100% and another saying proceeds. But the 100% to charity was what I planned. I spent a fortune on advertising. A ZOmbie walk and music festival at the worlds richest Football club would have brought thousands. There was a fun fair booked too. But when they cancelled […] I was left with bills for adverts in big magazines, with boxes of fliers and posters. I hoped that Halloween would cover these costs but alas, they didnt. Just read that part again. That’s a confession, isn’t it? The Halloween Parade raised no money for charity – Carl has admitted this several times. Carl had debts from the failed MCFC event – he’s admitted that before as well. But what he hasn’t said before, or at least not quite so explicitly, is that he organised the 2010 Halloween Parade specifically to cover his debts. Carl says he hoped that the Halloween Parade would cover all of his debts – but he’s said earlier that he was left over £4000 in debt by the failed MCFC event. 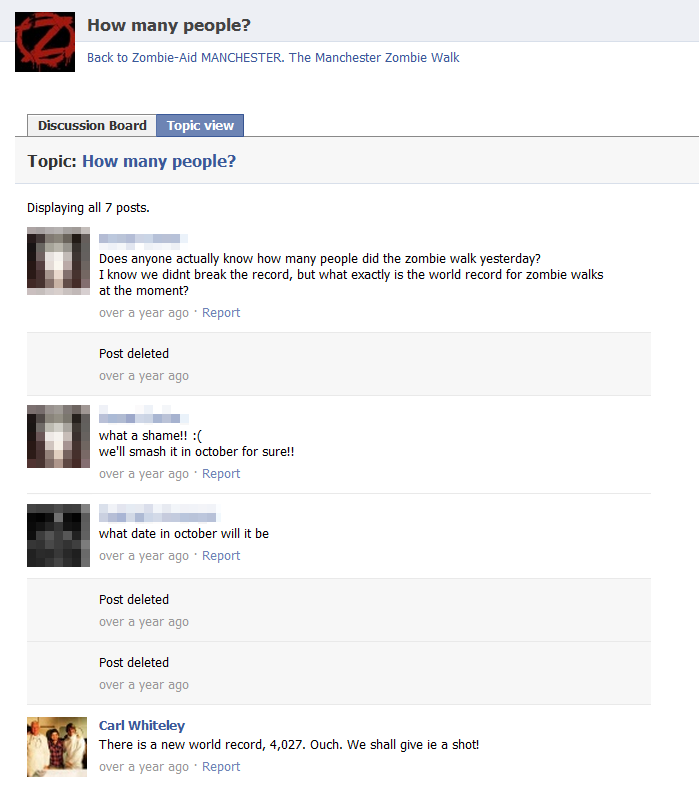 And Carl had organised two Zombie Walks in Manchester prior to this – so he had a pretty good idea about how much would be raised, and what all the costs were. Two Zombie Walks in 2009 raised a combined total of £1600. Carl had debts of £4000 before any organisational costs were incurred at all. When he was promoting the Halloween Parade, Carl had to know that there was very little chance any of the donations were going to make it to the charity. He hoped the event would cover his debts from summer – but there’s no hope that there’ll be anything left over to pay the charities with. So why did he tell everyone on the promotional material that all donations were going to charity? 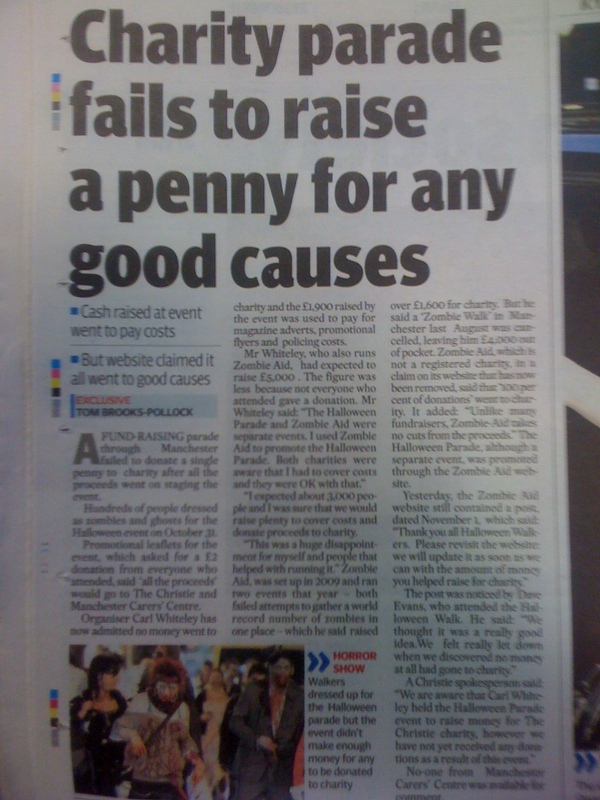 Even if he had used the word ‘proceeds’ everywhere, and even if you accept that there is a difference – Carl still misled every single person who donated to the Manchester Halloween Parade in 2010 – surely he must have known when he was promoting the event that the money collected wouldn’t even pay off his debts? What? If the summer event had gone ahead then Carl would have had no debts, and so he would have donated money to charity in winter? So it’s just the debts accrued by the failed MCFC that stopped any money going to charity, rather than the actual costs of the Halloween Parade? As I said earlier Zombie Aid is not a business. It is not a registered company with Companies House. It is not a registered charity. It is not anything – other than a name Carl Whiteley uses. Zombie Aid wasn’t in debt – Carl was. If I had been dishonest do you think the Christie would have worked with me the following year. Christie’s were Zombie Aid’s beneficiary in 2009, and an intended beneficiary in 2010. Christie’s were not an intended beneficiary in 2011 – the year following the Halloween Parade. Does that mean they weren’t willing to work with Carl? So – all that money got spent on ‘costs’ and ‘expenses’ as well? And debts, presumably. 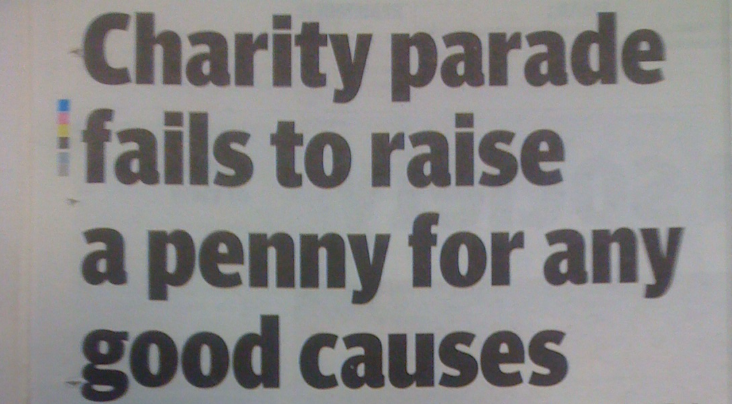 I’m speculating here – the only thing we can be sure of is that none of it went to any of the charities. 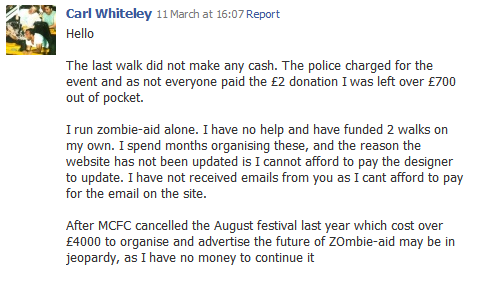 We will not be working with Carl Whiteley or Zombie Aid this year, and have no plans to work with him in 2012. I cannot say either way whether we will work with Zombie Aid in the future or not, but we have definitely made no plans to do so at present. Almost as if Zombie Aid are exaggerating their relationship with Smiffy’s, one feels. Almost like he’s starting to promote an event which he hasn’t actually confirmed with the other people involved – which sounds remarkably like what happened with the MCFC event last August (the one that caused all the debt in the first place). There have also been some interesting points made in the comments to my previous post. Some of them were made by Simon Dolby, who claims not to know Carl – but he does live at the same IP address as him so I can only assume that Simon hasn’t checked his airing cupboard, and Carl is sneaking out at night to use his computer. The Manchester Evening News also ran an article about Carl and the Halloween Parade. Further comments – from Carl or anyone else – are of course welcome (there’s a moderation delay on your first comment, to help prevent spambots getting through). Carl (and Simon, and all his other incarnations in your previous post’s comments) seriously needs to give up the ghost at this point. His blustering attempts to weasel his way out of this do nothing to assure us of his ‘good intentions’ or honesty at any point. I wouldn’t be happy until I’d seen receipts for every penny he claims to have spent on publicity, etc. Which, even if he could provide them (I wouldn’t hold my breath), would do nothing to excuse his deliberate misleading of the public – and if it wasn’t deliberate, why quibble over the semantics the way he’s doing? If it was all a genuine misunderstanding, why is he not accepting responsibility and discussing it honestly with you/us? Faking screenshots, using pseudonyms to defend himself, lying about his involvement with sponsors, I could go on. I was willing to give him the benefit of the doubt at first but if this is the way he defends himself against the clear facts as you have presented them – that he has deceptively taken money from the public under the pretext of giving it to charity, he needs to be pretty bloody careful. It’s fraud, and the more he scrapes the barrel, the bigger the hole he seems to be digging himself. I don’t know that there is an easy way out for him at this point but the long overdue truth would be a good start. Any consequences will be fully deserved. Well done to you, Dave, for all your hard work in bringing this to our attention. I’m sharing it with everyone I know and asking them to do the same. carl is a huge conman , he cons everyday people nevermind charities. come on!!!!! he lied about owning a planet to try sell it on ebay ffs….